AI Assistant empowers you to explore your data using natural language in conversation. The system presents statistical highlights of each visualization in easy-to-understand natural language dialog and reveals related visualizations to prompt further exploration. Human bias can skew the results of any analysis. Cognos Analytics helps eliminate bias by revealing relationships and patterns in your data that you might not have known to look for. Reduce risk, end uncertainty over outcomes, and take more confident and informed action. Organizations must be in tune with the needs of employees and be able to identify issues that could increase staff turnover. In a competitive job market employers have to find ways to reduce employee attrition. 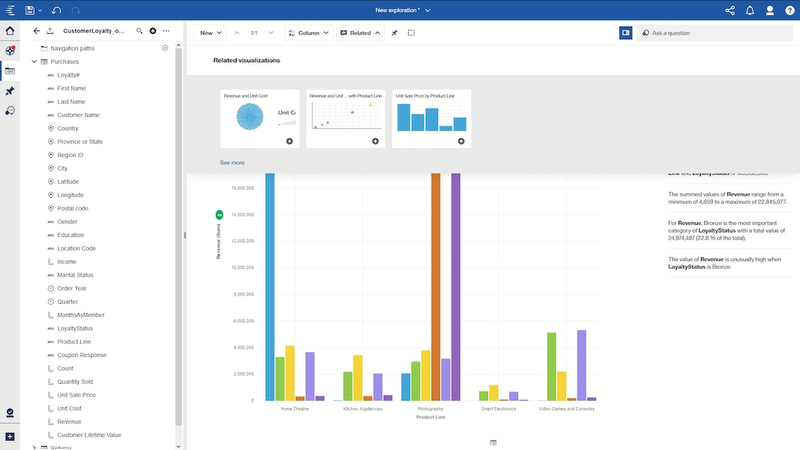 Cognos Analytics helps you quickly analyze data and share insights. With a deeper understanding of your data, you can better understand complex issues such as employee churn. Companies that can quickly make sense of their vast amounts of data, are better able to achieve success. Cognos Analytics enables business users to analyze volumes of data and build dashboards and reports in minutes. Using analytics and sharing insight across the organization leads to better business outcomes.